Grindhouse Dublin, in association with Light House Cinema, are proud to announce our Friday May 27th screening of Bride of Re-Animator, the first time ever the film has been shown on the big screen in Ireland! We've been running 3 years now and to celebrate we have a load of goodies to give away on the night! Special thanks to Arrow Video! Read below for more details! On the Night Prizes ! The first three people who hand their ticket in get an Arrow carrier bag, along with a limited collectors custom made Bride of Re-Animator syringe pen with green ink, and an Arrow Video badge. 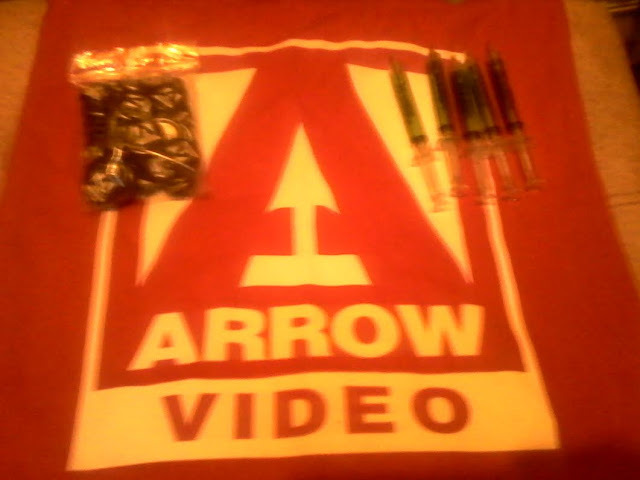 The next 40 people will each get a Bride of Re-Animator syringe pen + Arrow Video badge. And any late comers will each receive an Arrow Video badge. Something for everyone, and a great fun movie too. Again, special thanks to Arrow Video.